This volume contains fifteen selections from the writings of Hu Shih, Sun Yat-Sen, Liang Ch'i-ch'ao, and others. It uses traditional characters with Yale romanization. This college-level instruction series is viewed by many college Chinese professors as an alternative to the New Practical Chinese Reader series, as the format for instruction and the quality of the content can be considered comparable. Each chapter encourages Western students to develop the ability to communicate in Chinese social settings, as well as to read and write characters. The text layout uses Pinyin, simplified and traditional characters and English translation of dialogues, cultural notes, pictures and more. Studying words or practicing your pronunciation on their own will never lead to real proficiency in Chinese. Learning Chinese requires different approaches and activities to build all aspects of Chinese knowledge and usage. The Complete Chinese Learning Suite provides multiple applications to cover diverse modes of language learning. From immersion environments, to rapid building of vocabulary, to audio learning and reference aids, Complete Chinese Learning Suite provides dozens of different activities and approaches to offer a comprehensive set of Chinese learning tools. "Communicating in Chinese is for the beginning learner. The series now includes two student books and two activity books (for teachers), and provides the framework for a proficiency-based approach to learning standard Chinese. Focusing on all four skills (listening, speaking, reading, writing), the program consists of a series of graded tasks that approximate the real-life tasks that a student might face. The approach requires students to learn and manipulate vocabulary and structures to achieve specific real-life ends. The content of each lesson provides the student with the necessary resources, and the practice to develop the necessary skills, to use Chinese to achieve these ends. The Communicating in Chinese curriculum consists of task-based, interactive classroom exercises. The focus is on the learner, and students are encouraged to develop their own strategies to determine and express meaning. The material covers a variety of daily life needs, including becoming acquainted, making appointments, shopping, engaging in leisure activities, obtaining food and drink, and using transportation. All of these activities are presented in context at home, in school, or in common public places. 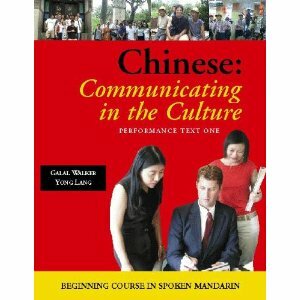 Through exposure to practical reading texts such as street signs, menus, advertisements, schedules, forms, and hand-written notes - in simplified and traditional characters - students gain familiarity with a wide range of Chinese written styles, and learn to convey simple messages by writing Chinese characters as well. The Communicating in Chinese series has been adopted by many schools and colleges throughout the United States and abroad." "Classical Chinese: A Basic Reader is the most comprehensive and authoritative textbook on the language, literature, philosophy, history, and religion of premodern China. Rigorously and extensively field-tested and fine-tuned for years in classroom settings by three members of the Chinese Linguistics Project at Princeton University, it sets a new standard for the field. Volume 1 contains 40 selections from texts written between the fifth century B.C. and the first century A.D., during which the classical Chinese language was fully developed and standardized. These passages, which express key themes in Chinese humor, wit, wisdom, moral conviction, and political ideals, are arranged in the order of complexity of the grammatical patterns they exemplify. Uniquely, each text is translated into both modern Chinese and English. Volume 2 contains a detailed glossary of unfamiliar terms and names found in Volume 1, and Volume 3 features detailed grammatical analyses, in which every sentence in the main texts is fully diagrammed to show the grammatical relations between their various parts. Four supplementary volumes--an introduction to grammar, readings in poetry and prose, selected historical texts, and selected philosophical texts--will also be available for use in conjunction with the main, three-volume set. There are corresponding exercises for all the reading texts in the Basic Reader and in the supplementary volumes to review and reinforce classroom learning. With Classical Chinese: A Basic Reader, Naiying Yuan, Haitao Tang, and James Geiss provide the definitive new resource for students and instructors of classical Chinese language or culture, one whose impact will be lasting." Functioning as both a traditional dictionary and a study guide, this list of the 500 most used words (characters) of Mandarin Chinese offers the English-speaking student of Chinese an essential source of vocabulary and a detailed reference to the world’s most widely-spoken language. Presented in order of frequency, each entry includes the Chinese character with pinyin transcription (Romanization), meaning, explanations of usage with examples, and a selection of words and expressions that have the entry word as the first element. Two indices also list the 500 words according to frequency and alphabetical order. This is the first text in a series of Mandarin Chinese learning texts, and it is for the beginning learner. It provides the learner with sufficient support in self-study help and in beginning a class. The book focuses on three major areas: instructional expressions, people, and places. An MP3 file accompanies this book. This Elibron Classics book is a facsimile reprint of a 1872 edition by A. H. de Carvalho, Shanghai.